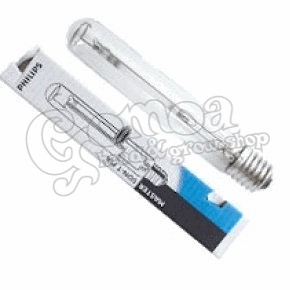 SON is the Philips name for arange of high-quality highpressure sodium lamps.The Philips MASTER SON(-T)PIA PLUS and the MASTERSON(-T) PIA Hg-Free are highpressure sodium lamps with PIA (Philips Integrated Antenna) technology. The sintered aluminum oxide discharge tube with integrated antenna is enclosed in a vacuum soda-limeor hard-glass outer bulb. The MASTER SON-T PIA (PLUS) lamps have a clear tubular outer bulb and the MASTER SON PIA (PLUS) an inside white-coated outer bulb. The lamps employ a ballast and ignitor in accordance with IEC. The increased pressure in the MASTER SON PIA PLUS lamps increases the luminous efficacy up to 150 lumen per watt. It is the most efficient SON lamp with the best light-technical performance resulting in the lowest energy use and therefore recommended for all new lighting installations and replacement in existing (PLUS) installations. In order to obtain this optimal efficacy and light-technical performance in combination with full retrofitability a discharge tube filling with sodium-mercury amalgam is needed. The PIA technology, the new construction and the new ZrAl getter are the guarantee for a reliable operation, low early failure rate and improved lumen maintenance. The new MASTER SON (-T) PIA PLUS lamps will be lead free. ?